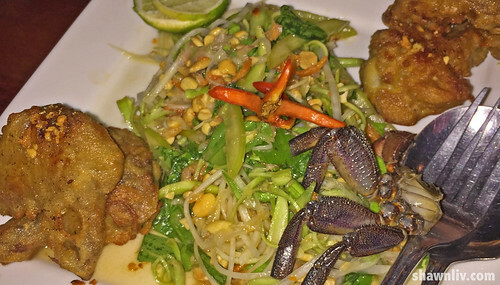 First, this is not WHAT TO EAT in Cambodia. Not about eating deep-fried tarantula, skinned frog or snacking on boiled duck fetus. It was just our top 8 flavor foods during our Cambodia Trip. About the TOP 21 Things we do in Cambodia Click Here! A tasty reminder of French colonization in Cambodia and is seen everywhere across Cambodia. 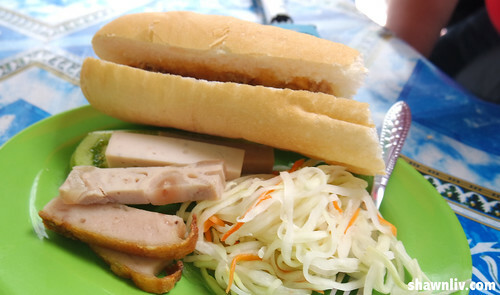 The sandwiches (nom pang in Cambodia) stuffed with slices of ham or any number of grilled meats, with Kampot pepper. The French also introduced beer, butter, pate, coffee, chocolate, onions, carrots, broccoli, potatoes and many other types of non-native produce to Southeast Asia. The short, fat rice noodles are stir-fried with leafy greens, soy sauce and fish sauce. 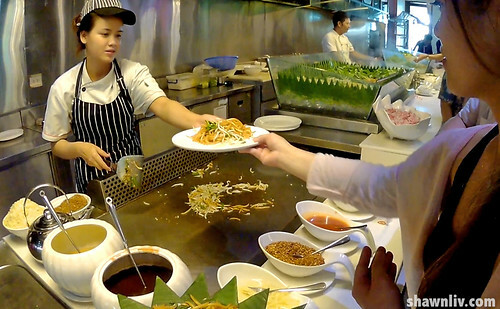 The noodles are cut short in length to match the texture of the bean sprouts and cooked with greens and green onions. Salty, sweet, spicy and sour, all tastes have all bases covered. This meal is served traditionally with a fried egg on top. You can easily find this from street carts to motorbike.Price about 1USD. Nom banh chok also known as Khmer noodles is a typical breakfast food; a beloved Cambodian dish. 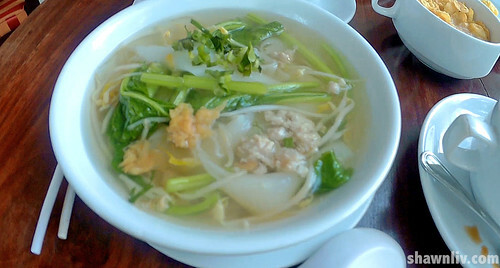 A bowl of Khmer rice noodle may consist various types of fresh vegetable topping such as shredded banana flower, bean sprouts, diced cucumber, and long beans, plus fresh mint and basil heaped on top. Its soup was made of pounded fish, prahok and a lot of herb. 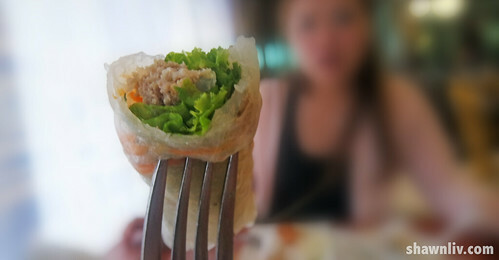 Fresh Spring Roll is a must try in Cambodia. Cambodia spring rolls are more vegetable-oriented. Stuffed with fresh raw greens, carrots, rice vermicelli and, sometimes, a little grilled chicken. Lastly, served with sweet peanut sauce, which is made of chili, palm sugar, vinegar, lime juice and crushed peanuts make these spring rolls a delectable dish. 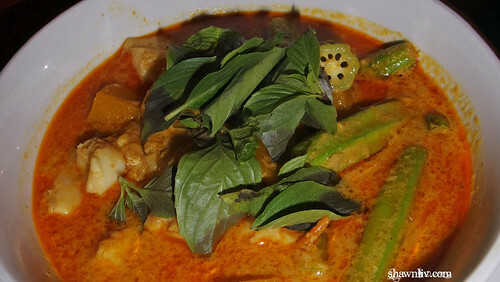 Khmer Laksa is one of the most popular dishes in Cambodian food. As compared to Malaysian Laksa, Cambodia Laksa was less spicy but tasty. 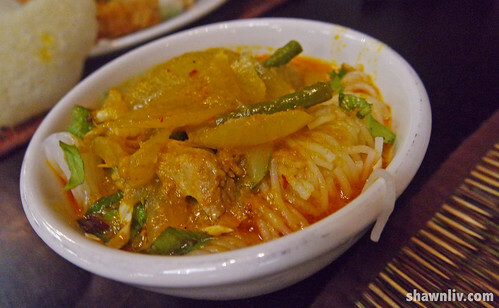 The thin rice noodles are added to a red curry soup with vegetables and fish sauce. Furthermore, a variety of options to add in including soy sauce, chilies, mint, bean sprouts, and cucumber. Green papaya salad is origin from Lao and it is one of the popular dishes throughout Cambodia, Vietnam, Thailand, and Laos. In Cambodia, the dish is called Bok Lahong. It usually mixes with salty, sweet and spicy flavors to create a refreshing and healthy side to any meal. Besides, you can pair this salad with Lemon Chicken or Kdam Prai Khmer (salty crab). This West and East Burger is a typical fast food with a huge variety of burgers from west and east. They have a huge variety of burgers, Europe, Italy, France, USA, Mexico, China, Cambodia and etc. West-East Burger’s French chef has creatively reinterpreted the classic burger in a range of delicious forms. French chicken burger with cheese and mustard sauce, Cambodian crocodile with cheese, Peking Duck and Chinese cabbage burger were the recommended burgers, The shop we tried near to the old markets (Siem Reap). Price about USD 5 per set + 20% discount. What are The top five cancer-causing foods ?